Metro Call-A-Ride Van Operator Dale Dean doesn’t consider himself a hero. A humble man with strong faith, he just considers himself blessed to have been there to help. But Berkeley resident Dorothy Dixon considers Dean her hero. In February, Dean was dropping off a passenger when he saw Dixon’s house on fire, and rushed to alert her and get her out of the house. Recently, Dixon got to meet Dean once again, and give a big hug to the operator who helped save her life. On February 7 around 6 p.m., Dean was driving a Metro Call-A-Ride customer home when he saw flames coming out of the roof on a home on McKibbon Road. There were lights on and a car in the garage, so he thought someone might be in the house. He ran up and banged on the door. Dixon came to door, startled. She had been napping, and the banging woke her up. She had no idea that her home was on fire. Dean then called Metro Call-A-Ride Dispatch to alert authorities, helped Dixon move her car, and let her stay with him and his passenger, who turned out to be Dixon’s niece, in the Call-A-Ride van, safe and warm while waiting for the fire and police crews to arrive. 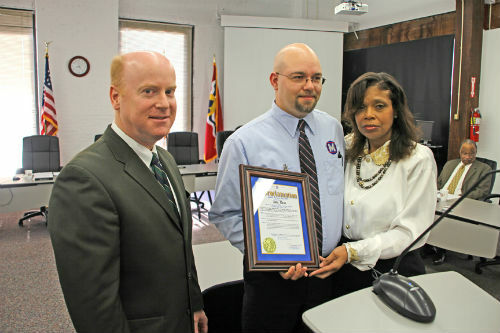 Metro President & CEO John Nations, presents an award for bravery to Dale Dean. Dorothy Dixon joined Metro in commending him. Dixon wanted to see Dean again to thank him for what he did so we invited her to the Metro Board of Commissioners meeting when Dean was scheduled to receive special recognition for going above and beyond the call of duty. He did not know that Dixon would be there. Her thank you was very emotional and she hugged Dean with tears in her eyes, and asked if there was anything she could do for him. Dean answered that he had been praying to God to use him to help others, and he believes this was exactly what he asked for. 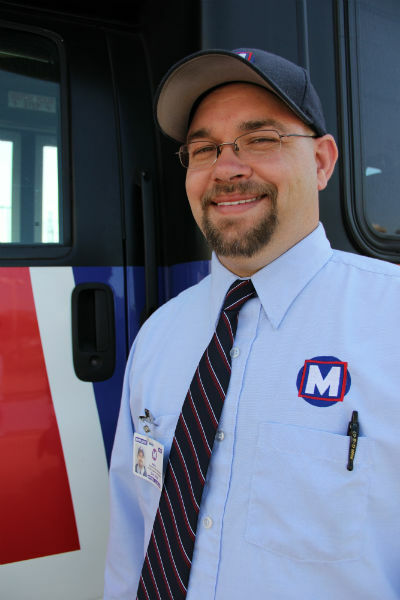 A Call-A-Ride operator for 11 years, Dean lives in Pevely, Missouri with his wife Kirstie. He says he loves driving, and in addition to being very active in his church, he enjoys camping, fishing, bike riding and Cardinals baseball.